Karla Caves are one of the ancient caves in Lonavala of Maharashtra that follows the mixed Indian and Buddhists style of rock-carved caves architecture. 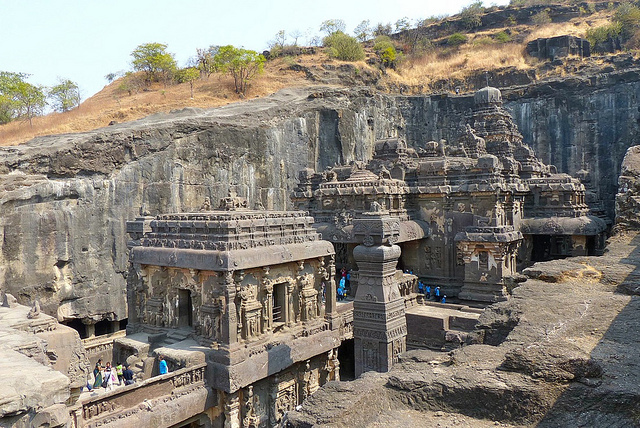 These caves are some of the largest rock-cut Buddhist shrines in India. These ancient Buddhist shrines were developed during two periods. The first period between 2nd century BC and 2nd century AD and second period between 5th century AD to the 10th century. 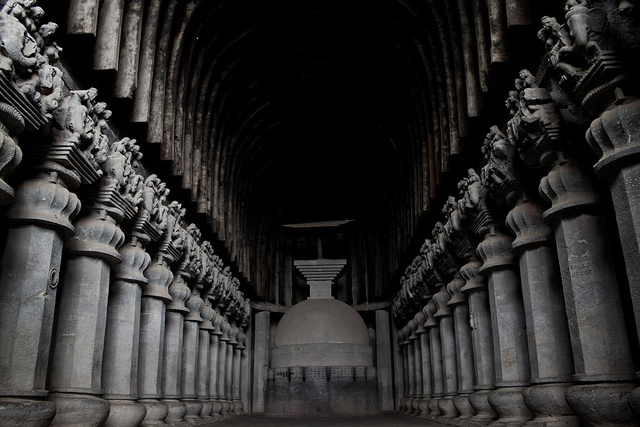 Karla Caves are very famous tourist destination because of their amazing architecture. Inscriptions and Stupas in the caves depict the ancient Buddhist architecture and culture. The early Buddhist school, Mahasamghika, is associated with these caves. Their popularity in this part of the region was wide-spread. The main cave consists of a chaitya hall that has 37 octagonal pillars and a base of water jar. The hall has many beautifully decorated sculptures of men, women and animals. The most important feature of this facade is that it is made out of teak wood. The access to the city hall is embellished with a horseshoe-shaped arch. There is an Ashoka pillar at the front side with a closed stone façade and Tirana in between them. There are large windows carved-out on the walls of the caves for lighting purpose. All around the cave complex, there are many chaityas and viharas. A Vihara is a place where the monks used to stay and meditate in the caves for a long period of time. Some sculptures of elephants dressed up well with metal jewelries placed there. Elephant Caves are a network of sculpted caves located on Elephanta Island and dates back to 600 AD. This island is located on an arm of the Arabian Sea and consists of two groups of caves-the first is a large group of five Hindu caves and the second one includes a smaller group of two Buddhist caves. It is 1.5 miles in length with two hills that rise to a height of about 500 feet. It is located about 7 kms from Mumbai’s mainland shore. Locally known as Gharapuri, which means the city of caves, it was a worship place for Hindus. 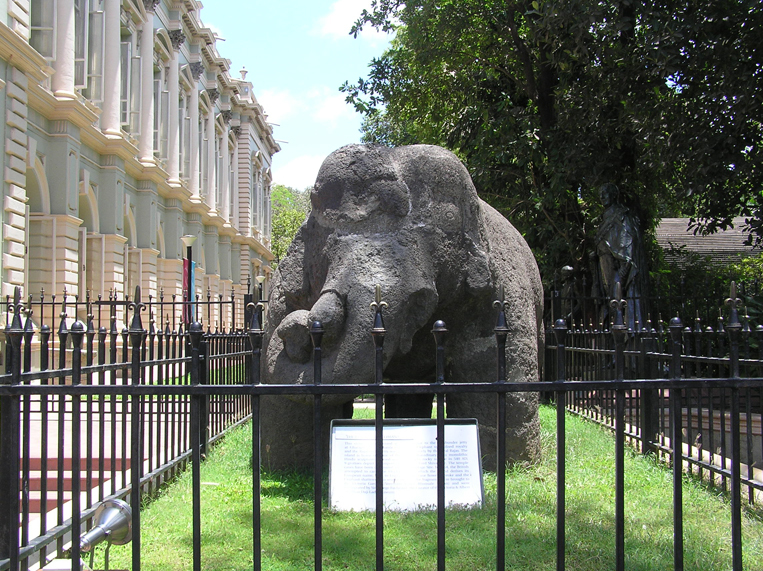 When the Portuguese arrived, they named this island Elephanta because of a giant statue of an elephant at the entrance of the caves. This statue now rests in the Bhau Daji Lad Museum in Mumbai. There were many paintings inside the caves, but now only their traces remains. 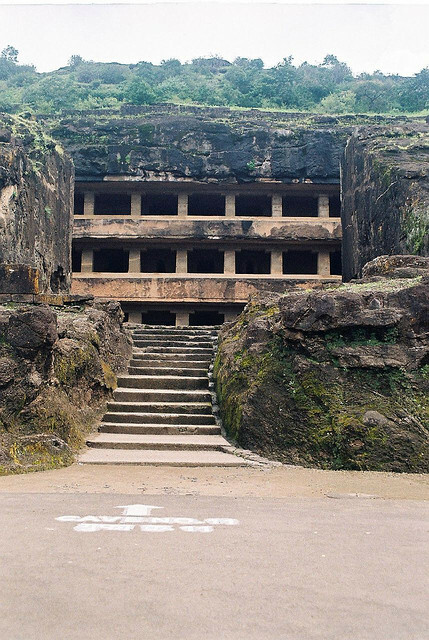 In 1987, these caves were given the status of a UNESCO World Heritage Site to preserve the artwork and are currently maintained by the Archaeological Survey of India. Through ferry or boat, one can reach there in one hour from the Gateway of India. Many visitors visit each year to see the exquisite sculptures of the caves. The cave complex consists of shrines, courtyards, inner cells, grand halls and porticos arranged in the elegant symmetry of Indian rock-cut architecture, and filled with delicate stone sculptures of Hindu Gods and Goddesses. 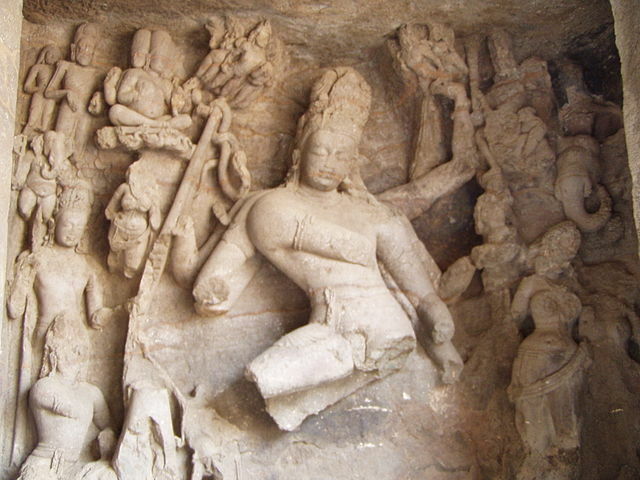 At the entrance to the caves, there is the famous Trimurti, the celebrated trinity of Elephanta: there’s Lord Brahma (the Creator), Lord Vishnu (the preserver) and Lord Shiva (the destroyer). Unfortunately, many of the sculptures inside the cave had been damaged by irreverent Portuguese rulers who took potshots at Hindu Gods with their rifles. There are few sculptures that are still in one piece. These caves are divided into three main parts – the main hall, east wing shrine and the west wing shrine. The main hall contains sculptures related to Ravana lifting Kailash, Shiva-Parvati in Kailash, Ardhanarishvara, Trimurti, Gangadhara, Wedding of Shiva, Lord Shiva slaying Andhaka, Nataraja, Yogishvara and Linga. The east wing shrine have Kartikeya, Matrikas, Ganesha and Dvarapala. The west wing shrine includes Yogishvara and Nataraja. 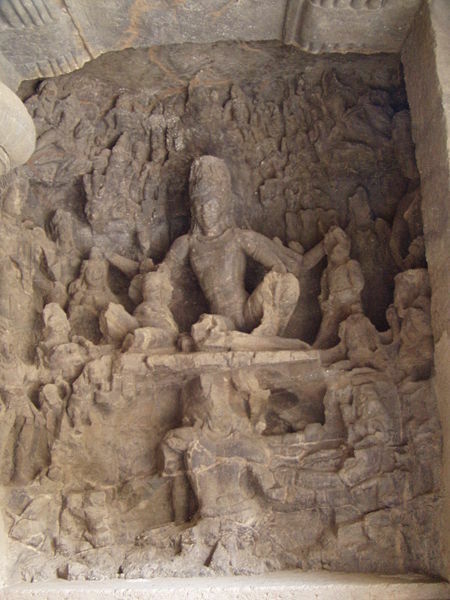 The types of caves and the sculptures shows that different dynasties held their sway over this island, namely, the Konkan-Mauryas, Trikutakas, Chalukyas of Badami, Silaharas, Rashtrakutas, Kalyani Chalukyas, Yadavas of Deogiri, the Muslim rulers of Ahmedabad, Marathas and then by the Portuguese. It is thus a major tourist attraction. For tourists, the caves open from 9 A.M. to 5 P.M. and are closed on Monday. Ellora Caves, one of the heritage sites credited by UNESCO is an impressive site of Buddhist, Hindu and Jain cave temples built between 6th and 10th centuries A.D. near the Indian village of Ellora. These caves locally called as ‘Verul Leni’. This site contains many exquisite sculptures. It is the most visited monument in Maharashtra state. Tourists flock in a large number there. One can enjoy visiting these caves maximally during the monsoon season as the nearby stream is filled with water and the local environs become lush green. 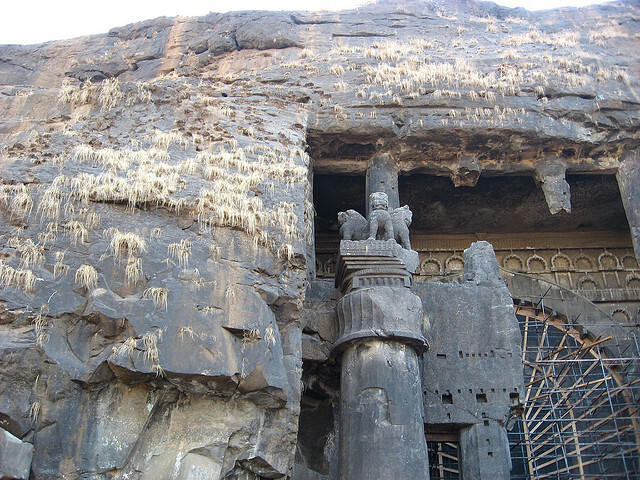 Ellora caves were carved out when the Ajanta caves were abandoned. 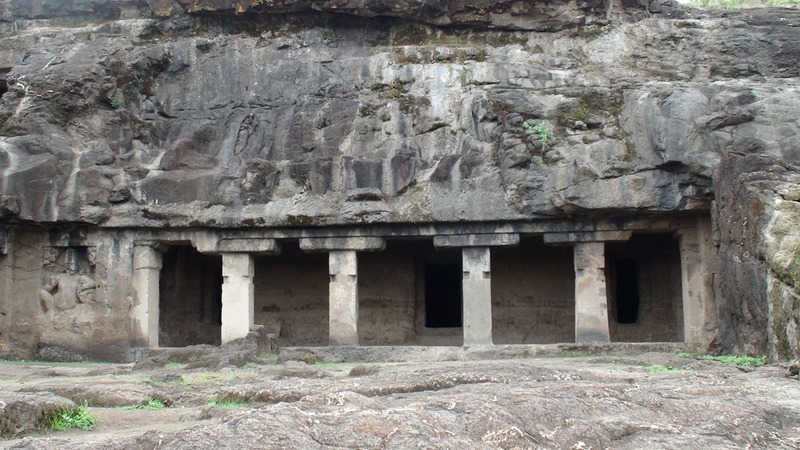 These caves were excavated from a large volcanic rock, the Charanandri hills. This hill plateau is in the semi-circular shape. When Buddhism was declining and Hinduism was growing, then these caves were excavated. The last building activity took place when the local rulers switched consecration from Shaivism to the Digambara sect of Jainism. Three different structures of different religions exist together there, that shows secularism in India, due to this it was designated as a UNESCO World Heritage Site in 1983. In total, there are nearly 100 caves in a hilly region out of which 34 caves are famous and the most visited. Numerous written records indicate that these caves were visited regularly by rhapsodized travelers. These caves have not only witnessed the three great religions but also illustrate the characteristics of ancient India and the spirit of tolerance. These breathtaking caves are worth visiting for their remarkable sculptures, paintings, and architectures. 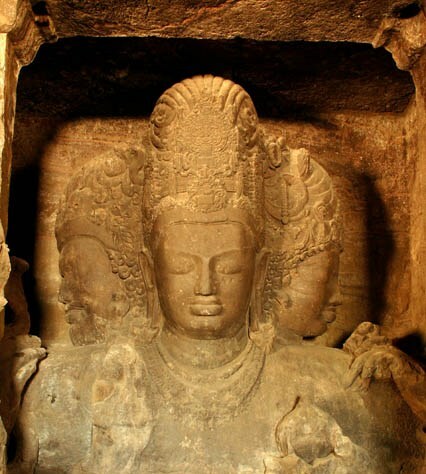 Buddhist group was the oldest in excavation and it comprises monasteries and a large temple of Buddha, then the caves of Brahmin group were excavated which are the best caves of the Ellora, and in the last Jain group was excavated. These caves are decorated beautifully and the visitors entice by its beauty greatly. Total 34 caves are there which are mostly visited by tourists. In all these caves, some of them belonging to Buddhism (12 Caves), Hinduism (17 Caves) and Jainism (5 Caves). These are numbered chronologically, starting from the Oldest Buddhist Caves. Buddhist caves are the earliest or oldest caves dating back from 500 to 750 AD. All these caves contain the sculptures of Buddha in various postures. These caves are decorated elaborately . 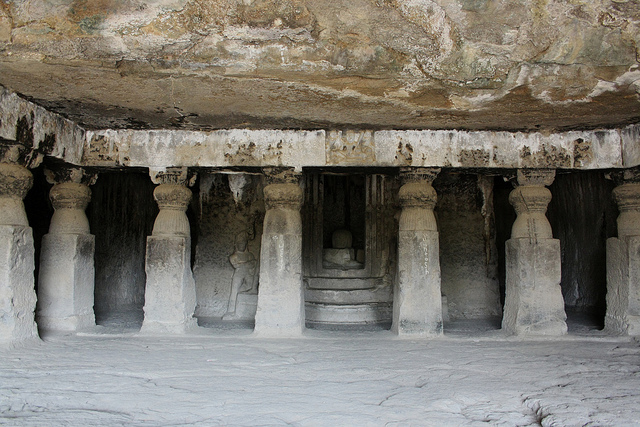 Hinduism caves are dated back from 600 AD and after that only the Jainism caves were excavated. Cave nos. 2, 5, 10 & 12 are belong to Buddhist group and Cave nos. 14, 15, 16, 21 &29 belongs to the Brahmanical group and Caves 32 & 34 belong to the Jain group, these are the most visited and famous caves. By visiting these caves, you will have a glimpse of all the three religions together, i.e. Buddhism, Hinduism and Jainism. Here is the brief description of the main caves visited most by the tourists. Cave 1 is a plain monastery contains eight cells and a large hall. It has very few sculptures and even not painted & designed elaborately. Cave 2 is a Buddhist cave, so lots of people visit it surely. It has a central chamber with 12 great pillars and is lined with sculptures of seated Buddha on a lion throne. The doorway of the monastery is surrounded by a muscular Padmapani, holding a lotus and a bejeweled Maitreya, the future Buddha, indicates that it is the cave of Buddha. Cave 3 and 4 are so much similar in design as that of Cave 2 but not much developed and in poor condition. 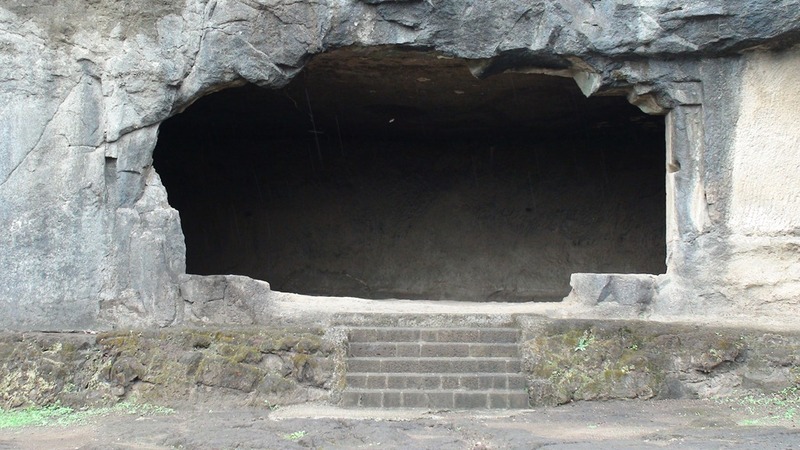 Cave 5, also known as the Maharwada Cave as it was used by the tribal men at that time as a shelter in monsoon. It is one of the Buddha caves. It contains a grand hall, two rows of carved benches, and a portrait of Buddha. Another shrine of Buddha is in the hall, in a sitting posture on a stool while touching his right hand on the ground, as in the Earth Witness gesture. Cave 6 is the home of two finest structures at Ellora. On the parched doorway, there is goddess Tara on the left side with a fierce but kind expression. On the right side, there is Mahamayuri, the Buddhist goddess of learning, seated on the peacock. An industrious student sits at his desk below. So we can say that Mahamayuri has a very similar characteristics to her counterpart, Saraswati. Cave 7 is a monastery that is undeveloped, pillars are broken away. On the back wall, five cells are connected and of which two cells are finished. It is visited by less tourists. Cave 8 consists of two halls and a shrine of Buddha. The inner hall with three cells on the north side and is cut off by pillars at each end. The shrine of Buddha has attendants at the door and inside of it there is a seated Buddha with his attendants. On the south wall, there is a sculpture of the Mahamayuri similar to that of Cave 6. On the back wall, there is a seated Buddha with Bodhisattva Padmapani and Vajrapani on each side of the wall. Cave 9 has a well carved facade and consists of outer balcony and an inner portico having two pillars, square from below and octagonal from above. Three Chaitya windows are there, ornamented well and each of them occupied by a figure of Buddha and many small figures are carved on the side of the seated Buddha. On the left side of the Buddha, there is a Padmapani with female attendants. Cave 10, a famous cave of the Buddha group also Known as “Vishwakarma Cave” dates back to 700 A.D. and is known as the Carpenter’s cave because of its imitation in stone of wooden beams on the ceiling. It contains a chaitya hall. At the far end of the cave, a seated Buddha is enthroned in front of a large stone Stupa. Cave 11 is locally known by the people as the Doha Tal or “Two Floors” cave. The top floor of this cave is just a long hall having columns on both the sides. There are many sculptures of the Buddha and other goddesses. Shrine of Buddha is located there and also the images of Ganesh and Durga are placed there. Both images show that after the caves were abandoned by the Buddha, this cave was converted into a Hindu temple. Cave 12, locally known as Tin Tal as it has three floors in it. It has an impressive upper hall which is big enough. The walls of the shrine are lined with five Bodhisattvas and flanked by seven Buddhas. This cave is decorated beautifully. Cave 13 located to the left of the Tin Taal. It has a plain room in it. Front of the cave had been destroyed by the decay of the rock. Now it is a kind of a rest house for visitors. Cave 14 is a Brahmanical cave, with four pillars in front and twelve inside the open hall, all of them carved. Its long wall is adorned with magnificent carved friezes and the entrance to the sanctuary is guarded by the river goddesses Ganga and Yamuna. Female scriptures of Ganesh and cadaverous goddesses of death, Kala and Kali. Many visitors come to visit this. Cave 15 was a Buddhist cave, later it is adopted by the Hindus. 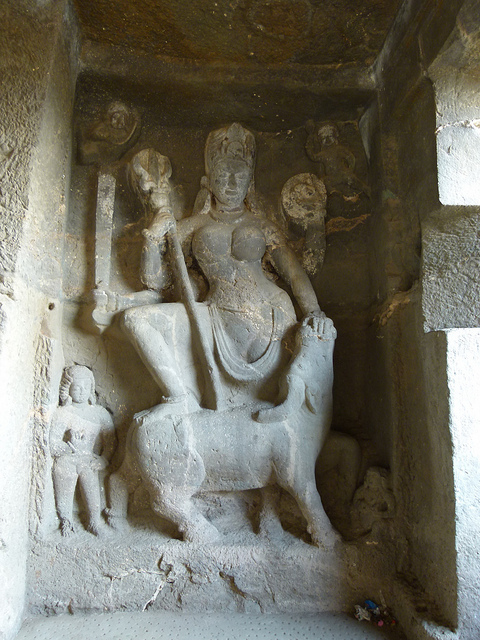 The ground floor is not much interesting, but the top floor has lots of the best sculptures of Ellora. On the right wall, there is a sequence of panels having ten incarnations of Lord Vishnu and due to only this, the name of the cave is Das Avatara. Sculptures of Shiva as Nataraja, the cosmic dancer is amazingly depicted. Cave 16 is a very notable Hindu cave but not a cave at all. It is a magnificent temple carved from a solid rock, patterned closely on the freestanding temples of the time. It contains many sculptures of Mount Kailash, known as the Kailash temple. It has a thick coat of white plaster that looks a snowy mountain on which this temple is located. This temple has stupendous architecture, with interesting spatial effects and varied sculptures. It took 100 years to complete and covers an area double the size of the Parthenon in Athens. Now-a-days it becomes a hub for tourists. 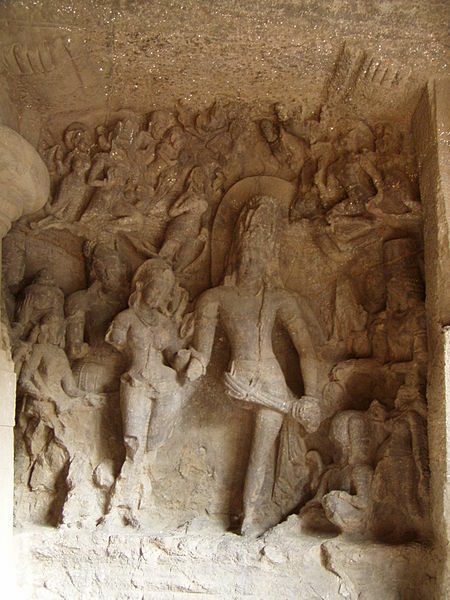 Cave 17 belongs to the Hindu caves, and carved between 600 and 870 AD. This cave has a main emphasis on female. Many female sculptures with their attendants are there. It occupies the center of the cave complex and attached to the Kailash Temple from all sides. Elaborately decorated this cave is visited by lots of tourists and pilgrims. Cave 18 is a plain cave, having a vestibule or antechamber with two pillars and corresponding pilasters in front. On the pillars, the few letters of a painted inscription in Devanagari script are still visible. It has many features to allure visitors in every manner. Late circular form of the pitha in the shrine, and the octagonal section has been added to the midsection of the lingam. Cave 19 is a massive square piece holds the large linguine and is composed of a square base with a rounded top. Some part of the roof’s cave has been reconstructed and excavated completely. The front pillars have gone now. The dwarpalas of the cave are of good height with minimum embellishment. Many visitors come over here to to see the ornamental quality of the cave. Cave 20 is divided into two sub-caves i.e. Cave 20 A and 20 B. Earlier, it has two pillars but now they are gone. 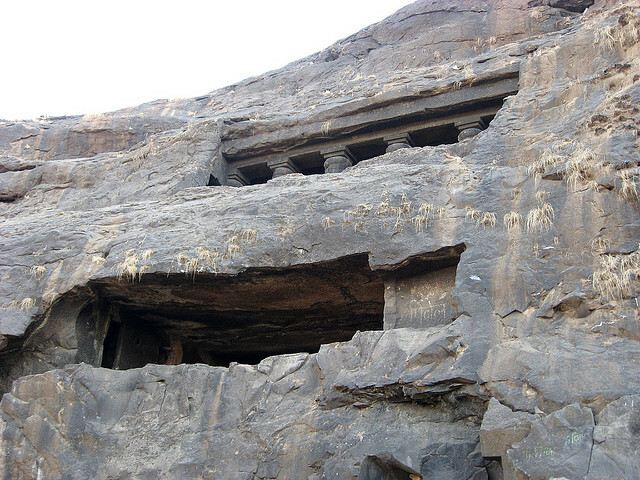 It is just a facade having columns with Kubera on the left side of the cave. Outside the facade, on the north there is a Ganpati, and on the south there is sculpture of Mahishasuri. It has a wide circumambulatory round to see the cave more prominently. On each side of a door is a tall dwarapala with a small female figure. Victory pillar and the remains of a pedestal for a Nandi is located on the platform outside the cave. Cave 21 the oldest Hindu cave at Ellora which dates back from the late 500s. Famous as only Rameshwara among the local people not by their cave number. It houses many fine sculptures, including a pair of river goddesses, two door guardians and a number of loving couples around the walls of the balcony that makes this cave very graceful. Lots of tourists visit this cave. 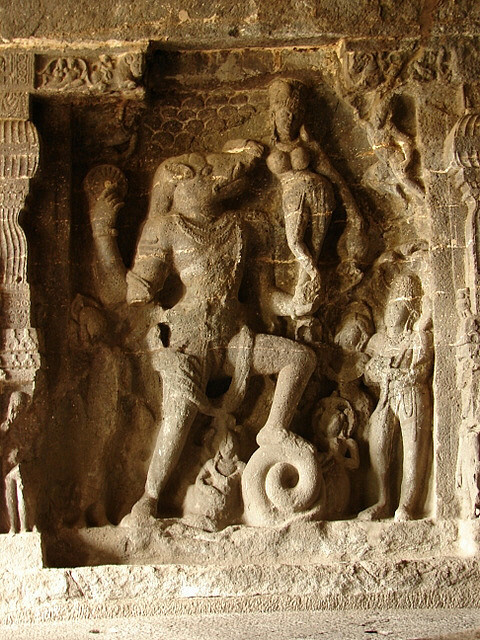 Cave 22 contains a few sculptures of Ganesha, the three devils, one on crocodile and a four armed Vishnu. In the shrine, there is a pedestal and a highly polished linga. Blue streaks appear on the linga, so it is named Nilakanta. On the south side of the cave, there is chapel with Astamatrikas, or the eight mothers, all four armed and the eighth with three arms. Many sculptures are worth visiting. Cave 23 is a cave consists of a partly double verandah with five doors entering into small cells. A small sculpture of Trimurti located on the back side of the wall. It is less visited by the visitors. Cave 24 contains five low cells called Teli-Ka-Gana. It has many small sculptures. Due to the fall off a cliff, entrance of the cave had been made and has stopped further progress as the rock was unsuitable for carving. 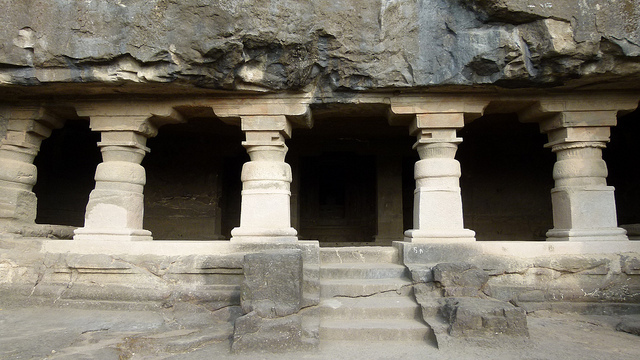 Cave 25 is also known as Kunbharwada. Earlier, its front part has been supported by large columns and pilasters but now it has fallen away. An image has been placed on a pedestal and a recess with a shrine behind it containing an oblong altar. Many sculptures of the Sun and god Surya with his chariot attract lots of crowds. Cave 26 is much similar to that of the Elephanta cave. It contains four pillars in front, two pilasters and also on the back side, there are two pilasters. In front of each pillar, there is a dwarf attendant. The door of the shrine is occupied by two large dwarpalas, one with a flower, and another standing stout. Also the shrine contains a Linga. Cave 27 is located on the edge of a ravine which separates it from the last Saiva cave and over the scarp, a fine waterfall is there that is also called Sita-Ki-Nahani. Visited mostly by tourist only due to its exquisite waterfall. Cave 28 is located under the cliff over which the stream falls. It has many cells and a vestibule and a shrine having dwarapalas and Vaishnava at each side of the door. 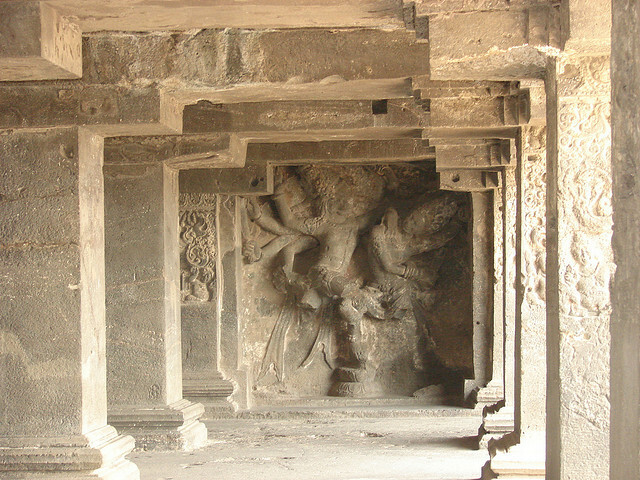 Inside the cave, the front wall is equipped with an eight-armed Devi with attendants. Have you ever heard of Jataka tales, Buddhist religious art and sculptures, monasteries, caves, etc? All these and many more simultaneously exist in or near the Ajanta Caves. So, Ajanta Caves provide many a more things to the tourist. It gives you hilarious knowledge of our rich historical past. The Ajanta caves are situated at a distance of 107 km north of Aurangabad, Maharashtra. Name of the “Ajanta Caves” comes from a nearby village named ‘Ajanta’ located at a distance of 12 km. History of this place is very sumptuous. The Ajanta Caves were discovered in 1819 by a British Officer when he was moving forward for a hunting expedition. He fined Buddhist monasteries over there. These monasteries were the teaching place of Buddhism. Many monks left the caves with an elaborate architectural carving and figurative sculptures that surely tempt any itinerant. When these caves were excavated, they are in horse-shoe shape. They are near 76m high narrow looking stream called Waghora. It was a place where Buddhist monks pursuit their intellectual discourses for a long period due to its calm and serene environment. After its instant discovery, the caves became an important tourist destination in the world. All the monasteries or we can say caves are connected from outside. Each cave has its own number from 1 to 28 according to their entrance. Some of the caves also hide by some rubble like Cave 15 A. Waterfalls around the gorge also fascinates people. Caves of Ajanta were made in two distinct time periods. They are famous for its sumptuous architecture, adorable sculptures and the only finest example of Indian art. Each cave was connected to the stream which makes it more picturesque. Description of caves is necessary to know further about it. So here is the detailed description of each cave according to their numbers. First cave of Ajanta was situated on the end of the horse shoe scarp. Now it is the foremost cave through which visitors move forward. It is one of the latest caves to have been excavated; also it was one of the best sites, but never worshipped by the dedication of the Buddha image in the central shrine. It has attributed to 6th-7th centuries. There are fabulous motifs on the doorway of it. This cave has one of the most imposing carved facades, with luscious sculptures and ridges. Most of the surfaces ornamented with decorative carving. Many of the scenes incise from the life of the Buddha as well as a number of embellishing motifs. Another shrine carved on the rear wall is to house an impressive seated image of the Buddha, his hands being in the dharmachakra mudra. The walls are covered with paintings in a deliberately manner. The scenes depicted are mostly sententious, devout, and exquisite, with scenes from the Jataka stories. Many of the scenes are of the life of the Gautam Buddha, and those of his veneration. The two most famous individual painted images at Ajanta are the pictures of the protective Bodhisattvas Padmapani and Vajrapani on either side of the entrance to the Buddha shrine. These two images attracts towards them most of the crowd. It seems different when seen from different angles. Another attraction is a goddess at the upper left corner of the shrine doorway. Her prosperous presence radiates its grace of the carving. She represents the earth, as she leans by the flowering tree. Enchanting Cherubic Dwarf, bearing a garland of flowers to the great Buddha. All those kinds of images are carved so that one can focus the devotee’s threshold towards the central image. No other thing is attractive than this, a four deer with a common head, one of the beautiful wonders of this cave is an art of clever composition. Even though, all the deer share one common head, but they seem distinct from all the views. The bodies look real, as they have been carved from accurate observation of their forms. Sweet pictures of lovers are also painted in the same cave. Many princesses have also been carved on the walls of the cave. They are heavily sprinkled over with a delicate tiara on her hair. Some of them are groups’ scenes which are intricately painted in such a manner that shows the dancing with musicians. Animals of that time are also painted very well like the golden geese, pink elephant, and bullfight. It suggests that all living things are one. So the incarnating pictures of cave 1 are skillfully designed and they are the prettiest pictures. They reiterate the happiness. Lots of travelers attract towards it and entangled in it. The second cave of this Indian heritage site is another adorable excavation, famous for its paintings, walls, ceilings and pillars. This cave is renowned for its ceiling paintings. It seems different from cave 1. Seated Buddha in dharmachakrapravartana mudra is enshrined in the sanctum; also the sides of the shrines contain two Yaksha figures to the east and Hariti to the right. The ceiling of the cave 2 is really charming. The skill with which painters lay down on shafts for long years, to paint these pictures is greatly admired. Thousands of Buddha’s paintings are painted on the walls in a very creative manner. The rhythmic movement of the princess starting of the movement of the swing is on the wall of the right hand corridor. The innocent faces and the bursting youth of the girl, shows the change. Physical vitality leads ultimately to illumination. The Jatakas paintings over here are of Vidhurapandita & Ruru. The gateway to this shrine is the same as of the cave 1. The square motif on the side of the doorway seems to be derived from doorways of other temples in India. Many motifs in Ajanta were taken from elsewhere, but adapted to the shrine here. The noteworthy feature of cave 2 is the heavy limbed, but swaying Avalokitesvara, with a flywhisk, who flanks the Buddha image. At right front of the cave, the pilasters with squatting dwarfs in between the medallions are enthusiastically carved. At the right of the cave, there is harati and panchika panel. So the cave 2 is heavily painted by the painters of that time and has been widely published. They depict the stories of Buddha’s life in an enumerable way. These paintings are didactic in nature, meant to inform the community about the Buddha’s teachings and life through successive rebirths. Most of the crowd moves toward it to get the experience of a real heritage site. Third cave of Ajanta is an incomplete cave resembles a monastery. From that time, only a pillared verandah is excavated and after that no work has been done until then. People attracts towards it only to see its verandah. Cave 4 is the largest monastery having a pillared verandah, sanctum sanctorum and a grand hall. It was once painted, even the traces of that can be noticed. Ceiling of the hall provides an illustrative impression of a lava flow. Seated Buddha shrine is depicted there very well. Some of the large Buddha images are unfinished. They are unfinished because at the time of excavation their patronage was finished. Another exciting thing about the cave is a double row of kneeling devotees by the crouching deer. It is in a fantastic look. Actually, they are witnessing the symbol of wheel of law. Picture of goddess at the upper left corner of the porched doorway with a flowering tree provides the amazing view to the cave. There is a flowery pilaster at left side of the interior. These incarnating pictures of cave 4 are skillfully designed. They reiterate the happiness. Lots of travelers attract towards it and entangled in it. Cave 5 is simply like the Cave 3, means the excavation doesn’t go beyond it. This cave is also an unfinished one. Porched doorway and female paintings on makaras are exceptionally good ones. Travelers move towards it only to see these female paintings. Cave 6 conjures everyone towards it. Buddha is seated with his feet squat in its preaching attitude. Sravasti and temptation of Mara are some of the important paintings. Sculptor of that time (Mahayana Phase) made a central pillar to support the wooden prototypes in the lower storey. Bare octagonal pillars are another feature of the cave unlike the other caves as they have capitals and bases with them. Porched doorway is not much carved. Female figures are attached to it very nicely. Bhikshu with Lotus is another attraction of this cave. It is designed in such a manner which shows rhythms and determination in sculpturing. Cave 7 is a onetime seen cave. Its broad verandah and ceiling is painted carefully. Carving of sculptures of Buddha is very simple. Cave 8 once again an unfinished monastery similar to cave 3 and 5. It is the oldest of the monasteries of Ajanta, located at the lowest level. Front portion of this cave had been swept away by a major landslide. Cave 9 & 10 are the two chaitya halls which was incomplete even at the end of second period of construction. Cave 9 consists of an entrance door, two side windows, central hall, and a stupa of worship. It has sculptures of Buddha and layers of paintings. These paintings are basically of Animals and herdsmen, giant horseshoe window, naga worshippers, etc. The paintings and 23 pillars attract the visitors most toward this cave. Cave 10 is so much similar to cave 9 in shape and size. It has the same large chaitya gathering hall, 39 octagonal pillars and a rock stupa of worship. It has two period paintings mainly the Jataka stories of Sama Jataka and the Chaddanta Jataaka and also the later period paintings contains the figures of large Buddha in various poses. Other things painted on the pillars and walls are Elephants in Jungle, Princess and tusk, Buddha and one – eyed monk, Bodhisattva, etc. All these paintings are the main feature of this cave which entices lots of tourist towards it. Cave 11 contains six cells and a long bench, a pillared verandah and a sanctum sanctorum. Little Buddha is carved on one of the walls. Paintings available in the cave are depictions of Bodhisattvas, figure of Buddha, etc. These paintings of Buddha are one of the earliest paintings at Ajanta. Another main feature of this cave which attracts the crowd towards it is the transition from the earlier Hinayana to the Mahayana Buddhist phase of worship. Cave 12 is a monastery dated back to 2nd-1st century B.C. but later that Cave 10. It is Hinayan monastery having front gate collapsed completely and twelve cells arranged on three sides. Cells on the front are decorated with chaitya window motifs; also the wall of the monastery records the gift of this cave by one merchant Ghanamadada. Cave 13 is a small monastery having an astylar hall with seven cells on three sides. These cells are provided with rock-cut beds. This structure most probably attracts the visitors. Cave 14 is similar to the unfinished monasteries which I have told you about that. It is also unfinished monastery excavated at a higher level. The figures of sala bhanjikas on the top corners of the doorway is beautifully designed that allures the tourists towards it. Cave 15 consists of two parts namely cave 15 and cave 15 A. Cave 15 and 15 A is very much similar having an astylar hall with the number of cells. Front of the cave 15 had an inscription of shell but now it has lost properly. The halls of 15 A are relieved with chaitya motifs pattern and rising from vedic pattern. Cave 15 also has an antechamber, sanctum Sanctorum and a pillared veranda. Depictions of Buddha in various poses also show the historical evidences. Traces of paintings show as it was originally painted. Excavation of the cave 16 was done by Varahadeva in A.D. 475-500. It is a monastery consists of a central hall surrounded by 14 cells on three sides, a vestibule and a sanctum for the Buddha image. Lions and other animals support this throne of Buddha, also Boddhisattvas stand behind him. This image of the Buddha is as similar as of the cave 6 and 11. The porched doorway set a pattern for the later doorway. Two goddesses of that time stand straight on neatly carved pilasters. Other features of this cave that entice the people much are the paintings depicting the miracle of Sravasti, Maya’s dream, certain incidents from the life of Buddha, giant statue of Buddha in the teaching posture, painting of dying princess in the shock of hearing that her husband has become a monk. Another inscription is of the Buddha with a begging bowl, prince Siddharth is stretching the bow, the descent of the Buddha, etc. The Sutasama Jataka is the famous painting of this cave narrating the story of the incarnation of the Bodhisattva and the son of the king of Indraprastha named Sutasama. They are painted in an elaborate manner that anyone can understand the story behind it. Cave 17: This monastery was excavated at the reign of Vakataka king Harishena having a spacious hall surrounded by 17 cells, a vestibule and a sanctum containing the image of Buddha. This cave houses a huge and a gigantic painting of the Wheel of Life, flying Apsara, Buddha preaches to a congregation, subjugation of Nalagiri, etc. The love of happiness diversifies through these pictures. Others are the paintings of Jatakas depicted very beautifully including Chhaddanta, Mahakapi, Hasti, Hamsa, Vessantara, Maha-Sutasoma, Saraabha Miga, Machcha, etc. Porched doorway of this cave is similar to cave 16. Another feature of this cave is a T-shape shrine doorway having goddesses supported by pilasters. Pillars of this cave are arranged in a strict order and also painted. They have intricate carvings on them. One of the famous paintings of this cave is the painting of Indra and the Apsaras on the above of the doorway of the cave. This cave is like a fantasy for every person. Cave 18: This cave is rectangular when it is excavated and leads to another cell. 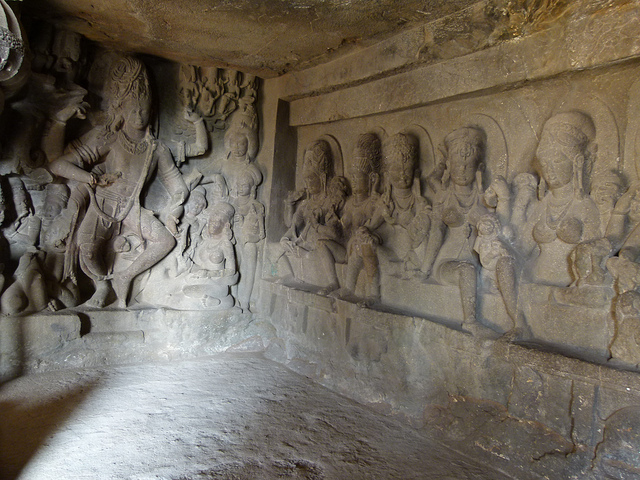 This Cave shows masterly arts like the painting of Shringar, that shows the decoration of women of her body. Another exquisite painting of this cave is a Princess looks at the mirror after touching shringar, one attendant holds a tray of toilet utensils and the other one holds a fly whisk in her hand. This marvelous scene allures the crowd towards it. Cave 19: It is a Chaitya Griha hall with many paintings, Stupas and Sculptures. One of the best Stupas is of standing image of Buddha. This Stupa has crowned itself with an umbrella that nearly touches the roof. Façade of this cave is very elaborate with pilasters. Another painting of this cave is of Naga king. It is a highly finished carving. The snakes put round their head which looks very auspicious shows the symbol of Naga king. So this cave is basically famous for its scriptural grandeur. Cave 20: This monastery has a pillared verandah, sanctum Sanctorum, a hall, multiple cells, etc. Verandah is full of Brahmi inscription that records the gift of Mandapa by Upendra. Many sculptures of Buddha accompanied by attendants in various postures are placed in the sanctum. Cave 21 is a monastery having a hall with twelve pillars, twelve cells, sanctum Sanctorum, pillared verandah, etc. The interior view of the monastery shows developed sense of the use of space. Pillars of the cave are beautifully carved. Sculpture of Buddha is exquisitely carved in a preaching attitude. Many paintings of Buddha are there showing preaching attitude. Another thing is a colonnade inside the Chaitya hall composed of 26 pillars. This combination forms aisles. The walls of the cave have wondrous carving. The round stupa of the cave is also decorated beautifully. Two main sculptures that attract crowds towards this cave are the large statue of dead Buddha and the statue of temptation of the Buddha by the demon mara. Cave 22 is a monastery consists of an astylar hall having four unfinished cells, sanctum Sanctorum and a narrow verandah. Many sculptures of Buddha are depicted in different forms in front and back sides of the wall of caves. Cave 23 is an unfinished cave like the cave 3,10, etc. it consists of an astylar, sanctum Sanctorum, antechamber, side cells and a pillared verandah. It is famous for its extravagant decoration of pillars and pilasters and the Naga doorkeepers. Again Cave 24 is an unfinished monastery and the second largest excavation at Ajanta after cave 4. Verandah, hall and sanctum Sanctorum is there, also a chapel is there with pillared porch which is excavated in the first period. The sanctum of the cave houses a seated sculpture of Buddha in pralamba-padasana. Pilasters, interiors of the cave, cells, hall all are unfinished. Cave 25 is a monastery having enclosed courtyard, an astylar hall, pillared verandah, etc.. The verandah has no cells and also the hall is devoid of the shrine. Cave 26: This cave is of largest dimension but much similar to cave 19. It is elaborately designed and have more sculptures. The chaitya hall consists of side aisles, rock cut stupa, etc. The façade consists of the inner pillars, the triforium, aisle side walls which are exquisitely carved with designs and images of Buddha. Most striking feature of this cave is the image of mahaparinirvana of Buddha on the right aisle. Various fine images of Buddha are sculpted on Chaitya horseshoe arch with an elegant skill. At the bottom of the hall relief, the Nagas, Nanda and Anupanada are figured holding the stem of the lotus in their hand. Another thing is the painting of a family group with bountiful floral decoration around it. Cave 27: It is a part of cave 26 and consists of two storeys in which upper one is collapsed partially, also it has a hall with four cells, antechamber, sanctum Sanctorum, etc. Sculpture of Buddha in teaching attitude is beautifully carved and housed in the sanctum. The parched doorway of it is the shrine doorway of cave 2. Another attraction is a Naga Dwarapala on the outer side of the shrine. Many features of this cave are similar to cave 20. Cave 28 is an unfinished monastery having nothing except the pillared verandah. No sculptures, figures and paintings excavated till now. Cave 29 is also an unfinished monastery and located at the highest level between caves 20 & 21. No sculptures and paintings excavated till now.